Giovanni Bonello: Histories of Malta. Vol. 12: Confusions and Conclusions. Fondazzjoni Patrimonju Malti, 2013. pp 244. 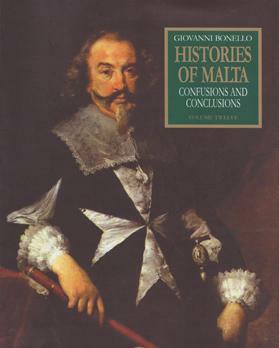 This could well be the last of a long series of volumes packed with Giovanni Bonello’s historical studies about Malta, the Maltese and people connected with our country. Like its predecessors, it presents a large variety, both chronological and thematic, of topics. Like them, it is characterised by a wealth of illustrations, mostly in colour, that make Bonello’s books so attractive, even to those who do not believe in reading as a supremely pleasant pastime. Bonello is well known for his distaste for colonialism, and in particular for its British brand, which Malta experienced for much of the 19th century, and a substantial chunk of the 20th. This distaste he shows unreservedly in two chapters. The first one relates the history of how the former Grandmaster’s palace (now the presidential Palace) in Valletta was denuded of its artistic treasures, furniture and other valuable chattels, as well as much of its huge armoury by British governors and military and civilian officials in the 19th century. The second chapter relates how the British fleet destroyed much of Alexandria in Egypt, following riots in which a number of Europeans were massacred. The Hidden History of the Looting of the Palace is a long article that rightly arouses the reader’s strong distaste, disgust even, for the way in which the colonial overlords saw the fine palace – with its even finer contents as their personal property – to be used and abused. Even administrators like Sir Hildebrand Oakes – the man responsible for what is now the National Library of Malta’s move to the building built for it by the Order and for the refurbishment and enlargement of our Manoel Theatre – is castigated for having cavalierly deprived the Palace chapel of a fine painting by Filippo Paladini, and of its altar. Bonello admits, however, that the Paladini painting was given to the Bishop of Malta, in whose palace it still stands. He could also have admitted that Oakes’s gesture was, on the whole, a decent one. Far less acceptable was the order given by that most despotic of governors, Sir Thomas Maitland, who spoiled the great council chamber by covering up Matteo Perez d’Aleccio’s epic Great Siege frescos, and changing it into an uninteresting Regency-style chamber to house the ceremonies of the newly established Order of St Michael and St George. The 1908 photo on page 108 of this book, taken when the frescos by D’Aleccio saw the air again, gives some idea of the damage caused by Maitland’s vandal act. When the same Maitland had a palace built for him on Corfu, an island also governed by him, he had no qualms about having paintings from the Valletta Palace sent to Corfu as adornments. This removal of paintings went on for a long time under different governors; regular public auctions were held, during which paintings by fine, old masters were sold for peanuts. A watercolour by Charles de Brocktorff, depicting a hall at the Palace, shows the number of paintings that still hung on the walls in the 1820s. Bonello shows how one of Mattia Preti’s most remarkable works, Boethius consoled by Philosophy, was hanging on a Palace wall but apparently disappeared early on, only to reappear at an auction in New York in 1992. Bonello has much to say on the unconscionable depredations of the Order’s very impressive armoury. Valuable items found their way to public collections in Britain, while many others were handed over as gifts to British officers. I have given just a tiny fraction of the many acts of depredation or negligent use made in the 19th century of valuables existing in the Palace. The long article makes for depressing reading for all those of us whose heritage was so shockingly impoverished in the past. A Maltese Murder and the British Occupation of Egypt shows another aspect of imperialism. In 1882, a Maltese man stabbed to death a young Egyptian, leading to widespread and violent riots against the many Europeans in Alexandria. This led to a great bombardment of Alexandria by British and French warships, which reduced whole areas to rubble. The French soon left, but the British stayed on. As the author says, the British occupation of Egypt had now started in earnest. Piracy in the Early British Era – the Maltese Connection is a lively contribution to the history of piracy in the Mediterranean in the 19th century. There were so many pirate ships around in early British times that a Vice-Admiralty Court was set up in Malta to try their misdeeds. Many of the pirates were Greeks, but seamen from other countries were tempted to try their hand at this crime. The author gives a long account, based on a contemporary publication, of the trial of Christopher Delano and his men in 1820. Most were condemned to death, Delano and three others having their corpses hung in gibbets at Fort Ricasoli. Another article likely to attract many readers, especially the older ones, is Cinemas in Malta Before World War I. The first cinema in Malta was Harding’s Cinematography in Palace Square, which probably opened in 1897. Other early cinemas included Cinema del Commercio, occupying the building that has long housed Caffe Cordina. In 1906, the Manoel Theatre was already presenting film shows, but it was only much later that it established itself mainly as a cinema. This went on until the Maltese government took it over in the 1950s. Particularly interesting is the importance given, even so early on, to films depicting contemporary events, such as the great Messina earthquake of 1908, or the funeral of King Edward VII. Bonello spreads himself out in Malta in the Newman and Achilli Drama, an account of the defrocked Dominican friar Giacinto Achilli’s impressively persistent seduction of women in Italy, Corfu, Malta and England. In Malta, his tenure as professor at the newly established Protestant College of St Julian’s was cut short when word got round of his serial adulteries and gallivanting, activities that led to the publication of scurrilous satirical verses from the vitriolic pen of the Maltese priest and versifier Giuseppe Zammit (known as Brighella). In Britain, Achilli remained absolutely true to form, and ended up being attacked by the famous former Anglican priest and Catholic convert (and future cardinal) John Henry Newman in a public lecture. Achilli sued Newman for criminal libel. Newman was found guilty after a trial that was regarded, even at the time, as having been grossly unjust. Achilli’s moral turpitude, however, was widely recognised, and even The Times of London denounced the trial as a great blow to the image people had of British justice. I enjoyed Bonello’s comments on the Maltese language used by Pietro Paolo Castagna in his Malta bil ghzejjer tahha (first edition, 1865), the first substantial book written in Maltese ever published. Many readers will be intrigued by the biographical article on the little known Maltese expatriate Luigi Borg Balzan, who lived abroad and died in 1896 in Florence. Here, he had a huge house, made much money and created for himself a large art collection; he was also an avid collector of honours, decorations and orders of chivalry. Other articles include an account of Italian knight Paolo del Rosso, whose career included exploits as a warrior on land and sea, 13 years in prison and the publication of several works, including an account of the lives and wretched ends of prostitutes; A Malta-US Deal in 1794; the curious Santa Liberata and the Bearded Female Crucifix; and a somewhat lack-lustre account of World War II pilot hero Peter Rothwell. This P. G. Wodehousian intrusion is much too facetious for its context.